This chicken sheet pan dinner is a great way to enjoy seasonal veggies. Get dinner on the table in less than an hour and with only one pan! I love when I can get dinner on the table quickly and easily – especially when I can do it with just one pan! It’s no secret I love sheet pan dinners. 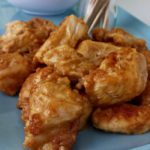 I shared one here just a couple of weeks ago and I’m back with this take on chicken thighs that are sure to get everyone around the table. 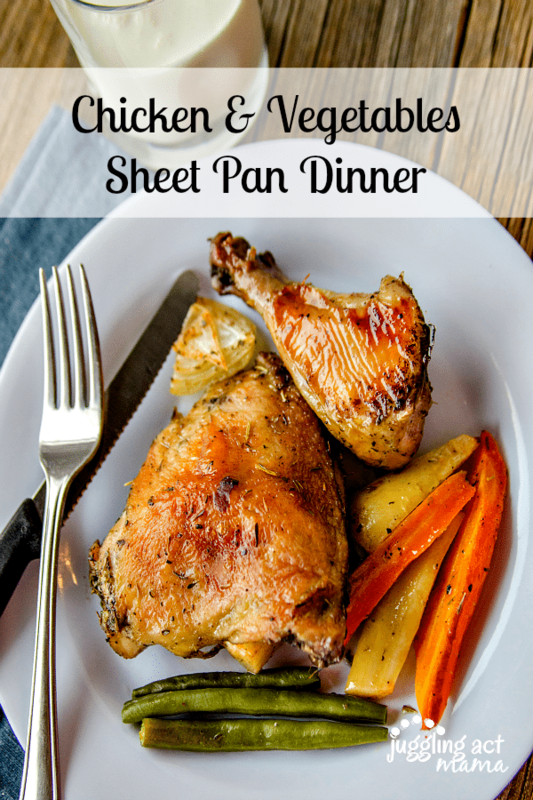 The great thing about this Chicken Sheet Pan Dinner is that it’s so versatile! You can tailor it to what might be in season at the time. For fall, I love these root veggies like the carrots and parsnips I used here, but you could also use potatoes and onions. Roasting vegetables always make them sweeter and bring out such rich flavor that just about anything you use will complement the chicken perfectly. Other great options might be squash, thick slices of zucchini, or even grape tomatoes and cauliflower. I would love it if you experimented and shared your results with me. Make sure you grab a copy of the recipe below. What Vegetables Are in Season Now? You’re going to love how delicious each bite is, and the simple clean up afterward, too! You can either choose to purchase legs with thighs attached or separate pieces. You can also use whatever veggies are the lowest price or in season. The amazing thing about this recipe is how incredibly easy it is to customize it to your own tastes. After making it one time, you’ll be able to change it up for a different meal time after time. The safe internal temperature for cooked chicken is 165° Fahrenheit (75° Celsius). Use a thermometer on a place on the chicken that isn’t near the bone. 3. Cut all peeled vegetables into thirds. Place into a bowl, add seasonings and oil and combined. What Spices Taste Best On Chicken? Chicken is a meat that tastes excellent with a wide variety of spices. Some of the most popular ones are salt, pepper, garlic, basil, and parsley. If you want something a bit spicier, add some red pepper flakes. For a brighter color and smoky flavor, add paprika. Thyme and rosemary are also very popular spices for chicken rubs. 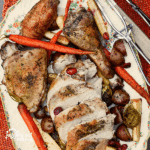 Italian Balsamic Chicken Sheet Pan Dinner – Healthy Seasonal Recipes – There is something irresistible about the balsamic glaze in this recipe. 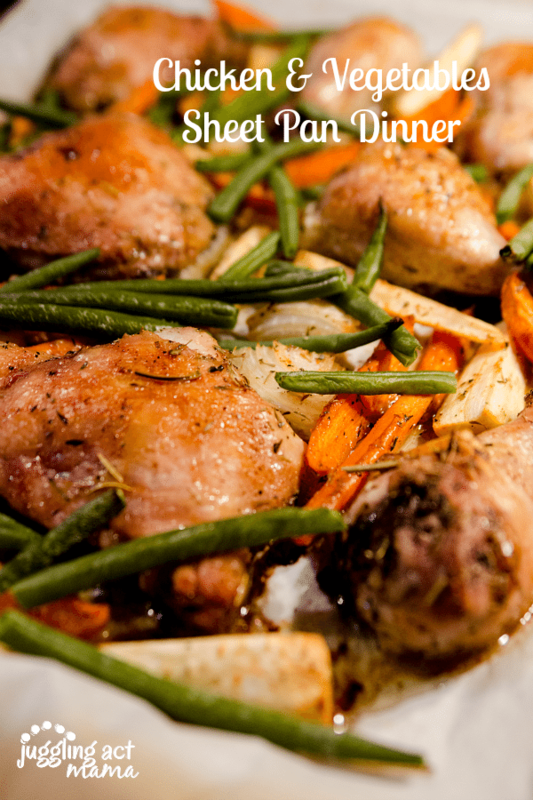 Greek Chicken Sheet Pan Dinner – Art From My Table – Olive oil, lemon and feta cheese top the chicken and veggies. It’s a fresh twist on a family favorite! 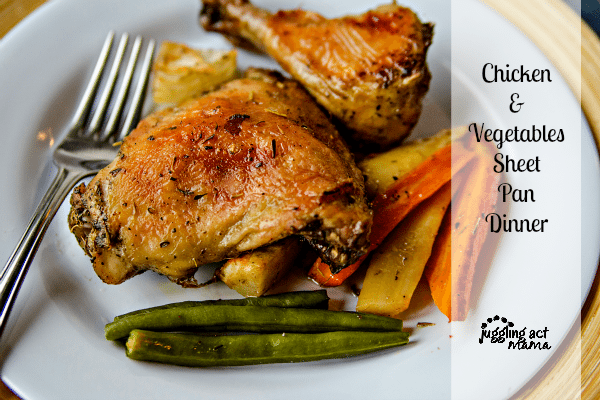 Sheet Pan Parmesan Chicken Drumsticks – Mashum Mom – The best thing about this recipe is how crispy the parmesan cheese gets. It’s so good!